Or: See Where You Pee. The theme for the Hackerspace Hack42 New Year's Eve festivities was "Unplugged"; use as little electricity as possible. We had our faithful wood stove "De Draak" for heat, lots of candles and oil lamps for light, wind up gramophone player and a few boardgames for entertainment, and a gas stove for food. 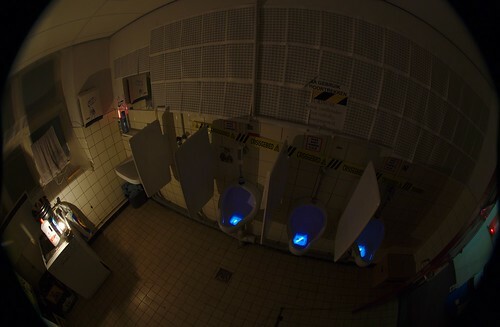 I chucked a few glow sticks into the urinals to improve aiming in the darkness.